Aljazeera America’s “Lockerbie: What really happened” was not news, it was a conspiracy theory. What was laid out was unsubstantiated rumor and innuendo which were said to be compelling because they corroborated other rumors and innuendos. This documentary does not meet minimum standards of journalism and reporting. It begins with two members of the defense team of the Abdelbaset al-Megrahi, the Libyan intelligence officer convicted of the bombing of Pan Am flight 103. Jessica de Grazia, a legal investigator, was by her own account hired at a late stage in the trial specifically to “find evidence to claim it was somebody else.” She claims to have sources associated with the Popular Front for the Liberation of Palestine – General Command (PFLP-GC), and their plot to take down Pan Am 103 on behalf of Iran. She spends much of the documentary chronicling the comings and goings of several members of this group without clearly establishing proof of their involvement, and even describes her own evidence as “great circumstantial evidence.” Her claim regarding Iranian involvement is that her source has told her that in a meeting of militants regarding the plot, it was said that Iran is going to provide funding. She never provides any evidence or names her sources. Baer claims that Iran contracted PFLP to take down five Western planes. He provides no evidence of this and does not explain why no other planes were attacked. He also claims to have “great intelligence” that shows that Iran put the two PFLP members that he believes conducted the attack in what he describes as an “honor roll” for services provided to the Islamic Republic. He does not provide this intelligence and only says that it will be included in a future book he is to author. Baer had claimed that Iran supplied funds to the PFLP after the Lockerbie bombing, Marquise denies that statement and said that the PFLP had accounts all over Europe and that, to his recollection, there were no funds transfers of significance during the course of that investigation other than the money that had long been regularly supplied to the PFLP by Libya. The only discussion of physical evidence came in the form of arguing that the components of the bomb – including a Toblerone candy wrapper and a Toshiba radio cassette player – that they claim points to Syrian bomb makers rather than Libyans. Marquise stated that, even amongst experts, this is a matter of interpretations and opinion. How in a post Iraq War era Western outlets are still treating as credible the allegations of defectors is baffling. Various Iraqi defectors provided much of the misinformation that became the backbone of the faulty U.S. intelligence rationalization for invading Iraq. “The [Iraqi National Congress] intelligence isn’t reliable at all,” said Vincent Cannistraro, a former senior CIA official. “Much of it is propaganda. Much of it is telling the Defense Department what they want to hear.” Rafid Ahmed Alwan al-Janabi, A.K.A. curveball, supplied much of the faulty intelligence regarding chemical weapons in Iraq, he later proudly admitted to having lied and said he was happy that his lie helped topple Saddam Hussein. Former CIA official Tyler Drumheller said that curveball was “a guy trying to get his green card essentially, in Germany, and playing the system for what it was worth.” This experience has clearly shown that many of these individuals operate out of hostility and bitterness towards individuals or governments and are willing to make false allegations to facilitate hostility towards their former employers or to seem valuable to their new hosts and benefactors. Part of the allegations in the documentary is based in Defense Intelligence Agency (DIA) reports that claim the PFLP as responsible with financial backing from Iran. U.S. intelligence, as has been proven on numerous occasions, is far from reliable and even very detailed reports are revealed to originate from unreliable sources with ulterior motives. Robert Baer claimed that the reports represent the consensus of the intelligence community, however, Marquise stated that they are reports provided to one intelligence organizations and that they likely were not given much weight by even the DIA itself. Additionally, he refuted another Baer claim that the intelligence community was divided over the Lockerbie investigation’s findings, saying that the investigators in the CIA and FBI were in full agreement over what happened by the end of the investigations. Also, it is claimed that the initial direction of the investigations was towards Iran and the PFLP. This should not be considered evidence against Iran, it simply proves that investigators examined this theory and ruled it out. One of the PFLP members at the center of the documentary’s allegations, Marwan Khreesat, also claimed through an unnamed associate that Iran was involved. Obviously, the credibility of such an individual is highly suspect. When, on Consider This, Kaveh Afrasiabi confronted Mora about the established connection between the Khreesat and Jordanian intelligence, Mora claimed there was not enough time to include that fact in the documentary, a notion that at the very least constitutes an admission that the facts in this matter were picked selectively to fit a narrative being pushed by the producers rather than to put forth an objective account of the events. The fact that this documentary aired on Aljazeera American is also noticeable because it is likely that many other outlets refused to air it. The documentary was not created by Aljazeera, and Aljazeera’s limited audience and visibility in the U.S. makes it an unlikely first choice for the producers. Aljazeera also has a long history of anti-Iran bias. Therefore, the evidence indicating an Iranian involvement can be summed up as the allegations of former al-Megrahi defense employees and their unnamed sources, a CIA agent who was not involved in the investigation, a long discredited defector, unnamed associates of someone the documentary calls a terrorist, and DIA documents that was likely considered unreliable by the DIA itself. 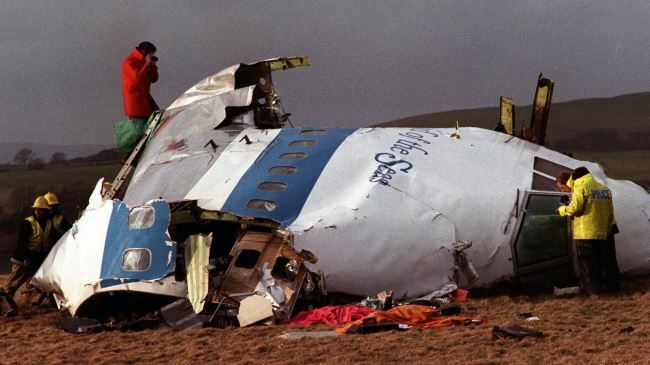 Some of family members of the Lockerbie victims also appeared claiming that they question the official account as offered by the U.S. and U.K. governments. Though they deserve a tremendous amount of sympathy, they have no factual evidence to offer on this matter and they are hardly unified in their positions. A victim’s family member named Paul Hudson appeared on Consider This to assert that he believes that the Aljazeera documentary reflects al-Megrahi’s defense’s positions and that millions of dollars was given to the makers of the documentary by the Libyan government.